This wonderful condo is part of a new beachfront/oceanfront complex with just thirteen units and only steps to your own private beach on Nantucket Sound! The property is in excellent condition and well maintained. We are in the heart of Dennis Port on mid-Cape Cod and within a short walk to several of the Cape's best known restaurants. Forget the beach sticker...you won't need it here! Whether by land or sea, there's something for everyone. This is a great place to make memories. The location is perfect..only steps to our private beach. 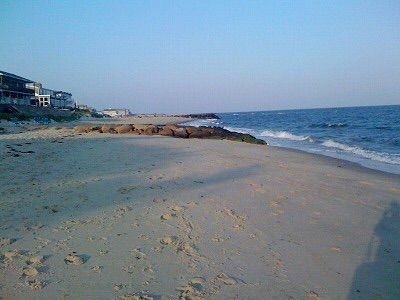 I can walk to my favorite restaurant on the Cape or walk on the beach to the Beach Bar. Everything is so close, yet the area is peaceful and private...and a fireplace during the cool weather! Who could ask for more? Great for summer beach vacation, or a romantic getaway any time of year! Being able to walk out my door with a cup of coffee taking steps to the private beach...not having to pack up and drive to the beach or find parking.. I can come back to the house at any time. It is simply perfect! The property itself was right on the Beach. Just down one flight down to sand and waves. The condo was very comfortable and in great shape. There was nothing missing that we would want. It was a perfect mini getaway for my better half and me. Would definitely stay again or recommend to another couple. My husband, myself and our dog "Ellie" had a fabulous time..we were welcomed to the condo by Laureen, the owner, with a hand written note, a bottle of wine and a bag of Cape Cod potato chips which paved the way for a very relaxing and carefree week. This condo is amazing and had everything we could possibly need including sand chairs, umbrella, and cooler. The rooms are very spacious, the bed very comfortable, WiFi, cable tv, and condo is close to great restaurants, and best of all just steps to the beach..oh and did I mention, although we didn't need it, this condo is handicapped accessible. Laureen definitely paid attention to every detail to make everyone's stay enjoyable! THE PROPERTY WAS NICE AND CLEAN GREAT JOB ,BUT THE ONE PROBLEM WAS THE CONTRACTORS GOING ON . GREAT TIME VERY CLEAN CONDO NICE AND QUIET VERY RELAXING BUT THE ONLY PROBLEM WAS THE CONTRACTORS GOING ON RIGHT NEXT TO THE CONDO OTHER THAN THAT VERY NICE TIME..
Great location right on the beach! The condo was as expected-clean, comfy and really cute. Location and the private beach were fantastic! Laureen was great to communicate with and replied promptly. I’m looking forward to staying again. My only complaint (which had nothing to do with the condo) was the construction noise next door. It began each morning at 7:30 and lasted all day. We enjoyed our stay and loved the location right off of the beach! So convenient to walk out of the condo and out to the beach. We loved the Dennisport area and it’s local restaurants and stores. And Laureen was very responsive and very helpful. We would love to come back! Our condo is part of an oceanfront property with a private beach located on Cape Cod's beautiful Nantucket sound! Its central location provides for easy and convenient access to attractions and activities anywhere on Cape Cod. Dennis Port and the surrounding area is home to some of the finest dining, beaches and golf venues in all of Massachusetts. Payment terms: 50%upon receipt of signed contract, with balance to be paid not later than sixty (60) days prior to check-in. Cancellation policy: 100% of funds paid if cancelled more than 90 days prior to check-in, and 50% of funds paid if cancelled between 60 & 90 days of check-in. Refunds are not provided for cancellations within sixty days. Payment may be made by personal check or money order.